Takeaway: Laboratory testing provides vital information needed to ensure the success of any trenchless project. Every trenchless project is different, financially as well as geotechnically, even if multiple projects happen to pass through the same area. This requires every project to be evaluated individually based on the purpose and scope of the project. 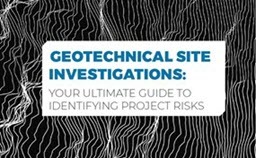 Site investigation is crucial, and overlooking this crucial aspect can have costly repercussions. Site investigation can be broadly classified into four stages: reconnaissance, data and map study, in-depth or intrusive investigation and laboratory testing. Soil samples recovered during the intrusive stage of site investigation are often tested in the laboratory to determine the physical characteristics of rock and soil in the subsurface strata. This test is carried out on disturbed and undisturbed soil samples and is used to categorize strata in the section. For granular soils, the most important test is the particle size distribution test, which is important in determining the drainage characteristics of soil. For cohesive soils, classification tests carried out are for moisture content, bulk density, particle size distribution, and plasticity known as the Atterberg limits. A profile of moisture content to depth is helpful in determining zones of softening due to groundwater seepage. This test is performed as per ASTM D422, and is used to evaluate gradational characteristics and soil classification. It determines the proportion of gravel; coarse, medium and fine sand; and larger particles in a soil sample. The soil is first ground to disaggregate it and then is passed through a 2 mm sieve. What is left behind in the sieve after sieving is weighed against the whole soil sample and the percentage is calculated. Clay and silt cannot be separated by sieving and are separated by sedimentation since larger particles settle more quickly than finer ones. Silt settles faster than clay and by measuring the speed at which the suspension settles out, the particle size distribution can be determined. This test is performed as per ASTM D2216 & ASTM D2937 respectively, and determines the moisture content and dry unit weight of the soil sample. It helps evaluate active and passive earth pressures, relative soil strength and compressibility, and soil overburden. The procedure involves weighing the difference between the original sample and an oven-dried sample by following test guidelines. This test is performed as per ASTM D4318 and aids in classification of soil and its plasticity characteristics. It evaluates the shrink/swell potential of near-surface soil and can be used to distinguish between silt and clay, and its different types. It gives the shrinkage limit, plastic limit and liquid limit of the soil sample. This test is performed as per ASTM D7263 and can be used to convert the water fraction of soil from mass basis to volume basis, and determine the degree of soil compaction. Bulk density is the mass of sample per unit volume including voids. Since bulk density varies with moisture content, the water content is determined at the time of sampling. Shear strength testing is carried out for analyses of short-term and long-term slope stability. Short-term analysis is carried out using undrained triaxial tests which are quick and cheap to conduct, allowing for multiple tests to be carried out. Tests for long-term stability are carried out using consolidated and drained tests, but take a longer time since the sample has to be consolidated using confining pressure. These tests are expensive to carry out and are done minimally. Short-term and long-term analysis tests also provide information regarding the moisture content of soil and its bulk density. Since granular soils cannot be retrieved undisturbed, the soil is re-compacted inside a shear box. The soil’s friction angle is then determined by direct shear and the tests are carried out under saturated conditions. This test is performed as per ASTM D2850 to determine the compressive strength of a soil. In the test, fluid is not permitted to enter or exit the soil as the load is applied. Specimens are subjected to a confining fluid pressure in a triaxial chamber and load is applied axially at a constant rate of axial deformation. The compressive strength of the soil is determined in terms of total stress, therefore, the resulting strength depends on the pressure developed in the pore fluid during loading. This test is performed as per ASTM D3080 and is performed on three or four specimens of an undisturbed soil sample. A shear box consisting of two stacked rings hold the sample, and contact each other at mid-height of the sample. A confining stress is applied to the sample vertically and the upper ring is pulled laterally through a specified strain or until the sample fails. The American Society for Testing and Materials (ASTM) has many tests that can be conducted based on site conditions and project requirements in order to get a comprehensive idea of prevalent subsurface soil conditions. Often experienced contractors are able to foresee some situations that are likely to arise at a particular site based on observation. Such observations should not be sidelined, rather, they should be investigated. Soil investigation, both intrusive and laboratory testing, can prove to be a life-saver in terms of cost and time. The main advantage of undertaking these different tests is that it helps the contractor to select the best tool that will get the work done in the least amount of time while preventing cost overruns.